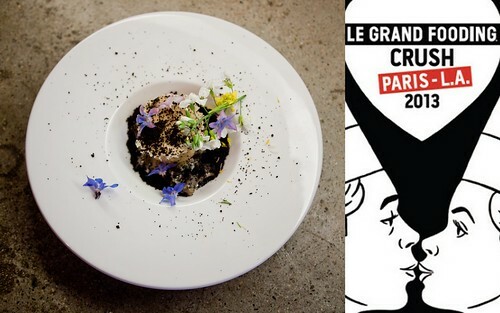 You have probably already heard about Le Grand Fooding: Crush, the posse’s upcoming inaugural event in Los Angeles on April 26-27. In fact, tickets went on sale a month ago, and a glance at the event website’s signage would indicate they’ve already sold out the duo of dates. Therefore, it would be cruel of me to rehash that participants include Nancy Silverton (Mozza), Ludo Lefebvre (Trois Mec), Josef Centeno (Bäco Mercat, Bar Ama), Roy Choi (Kogi BBQ, Chego, A-Frame, Sunny Spot), Jordan Kahn (Red Medicine) and Carolynn Spence (Chateau Marmont) as well as Parisian chefs such as Inaki Aizpitarte (Le Chateaubriand), Gregory Marchand (Frenchie), Jean-François Piège (Restaurant Jean-François Piège) and for VIPs, Sven Chartier (Saturne). …And yet! Maybe not. Fortunately, there’s an arguably even better opportunity for the winner of this giveaway. The pre-event dinner (wherein the winner of this giveaway plus a guest will join media and VIP) will feature a meal prepared by Craig Thornton of Wolvesmouth and Miles Thompson of Allumette. It’s no secret that I am a big fan of both chefs, so I can confidently say this dinner promises to be quite an adventure. And you may be in the company of some participating chefs from the main event. Comment below with a correct email address – this way I can get in touch with you – and why you want to go to the Le Grand Fooding pre-event dinner. You must do both of these; if you don’t and I can’t confirm you’ve done both, I’ll have to choose another winner should your number come up in the lottery. Contest will close Tuesday, April 23 at 5 PM. I will announce the winner via Twitter as well as contact you via the email you use to comment below. If the winner doesn’t respond to me by the end of the day on Tuesday, I’ll pick a new winner to be announced Wednesday morning. Disclosures: These tickets were given to me by MasterCard for promotional purposes to award to a reader, but I am responsible for this promotion. Winner must provide proper contact info to me, which I will then forward on to MasterCard. Your contact info will be used for fulfillment purposes only. This entry was posted in Downtown LA, East LA, Events, Giveaway and tagged Carolynn Spence, chefs, Craig Thornton, Crush, Dinner, DTLA, festival, giveaway, Gregory Marchand, Inaki Aizpitarte, Jean-Francois Piege, Jordan Kahn, Josef Centeno, Le Grand Fooding, Ludo Lefebvre, Miles Thompson, Nancy Silverton, Paris to LA, Roy Choi, sold out, Sven Chartier, Wolvesmouth. Bookmark the permalink.